A Baker's Cyst occurs when the volume of synovial fluid that lubricates the knee joint increases, causing swelling. 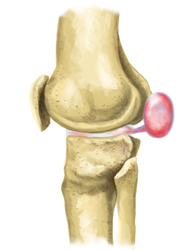 This swelling causes pressure to build and the synovial fluid to flow into the back of the knee. When the fluid flows into the back of the knee, it flows into a sac or bursa, creating a Baker's Cyst. The cyst will appear as a bulge in the back of the knee and is commonly referred to as feeling like a water-filled balloon. Baker's Cysts in children are a sign that there is a problem with the bursa, while adults with Baker's Cysts likely have an underlying knee injury or condition which caused the cyst to develop. Anything from a tear in a ligament or tendon of the knee, to arthritis, to a case of gout can cause a Baker's Cyst to develop. Symptoms of a Baker's Cyst include swelling, stiffness, pain, clicking and locking of the knee joint, and an inability to fully flex or move your knee. You may experience some, all, or none of these symptoms. Baker's Cysts can often cause a lot of pain or can go completely unnoticed. It is important to understand that symptoms are usually not coming from the cyst itself but from the underlying knee condition that caused the cyst to develop. By treating and ultimately healing the underlying condition causing the pain, you can get rid of your Baker's Cyst. If you want your Baker's Cyst to go away as quickly as possible, you need to rest the affected knee. Avoid any physical activities that could cause further injury to your knee. If your Baker's Cyst developed from a knee injury or condition, do your best to avoid the activity that caused this knee injury or condition. Consider using crutches to keep the weight off your injured knee and avoid re-injury. Do regular ColdCure® treatments to control the pain and swelling in the back of your knee. Once the swelling has gone down, you can start to focus on healing your underlying knee injury with regular BFST® treatments. This combination will work to finally get rid of your Baker's Cyst. Around the 4-6 week mark you can start doing some light stretching and strengthening exercises. Slowly work your way back to your regular level of activity. Continue doing BFST® treatments to maintain the healing you've done. Do a ColdCure® treatment if you experience any flare-ups of pain and swelling after you've recovered. You don't have to undergo surgery in order to get rid of your Baker's Cyst. You can get rid of your Baker's Cyst with conservative treatments. However, it's possible that your underlying knee condition or injury requires surgery. For example, if you have a severe injury like a full meniscus tear, conservative treatments won't heal this and you will have to undergo surgery. Only in rare cases is it required for the Baker's Cyst to be drained or removed. In order to remove a Baker's Cyst, arthroscopic surgery must be performed. If surgery is your only option, make sure your post-surgery recovery goes as smoothly as possible by using our products. Use a ColdCure® Leg Wrap to reduce the inflammation and relieve the pain for the first few days following surgery. Once the inflammation has gone down, promote blood flow to the injured area using a BFST® Knee Wrap. This will improve your circulation and help you heal faster. There is also a possibility that the Baker's Cyst could rupture, causing fluid to move into the calf and result in further swelling and pain in the calf. Symptoms of a ruptured Baker's Cyst are similar to those of a blood clot, so if you're not certain that your Baker's Cyst has ruptured, please see your doctor. The ColdCure® Leg Wrap is designed to relieve the pain and swelling associated with Baker's Cysts. Apply the Wrap to the back of your knee to target the area of your cyst for fast relief of your symptoms. Getting rid of the pain and swelling is the first step in the healing process. You always get an even distribution of cooling power over the back of your knee because the Wrap and the gel packs are custom designed for this area. Our unique RigiGel® formula doesn't move around inside the pack. RigiGel® stays in place to provide an even and consistent treatment, every time. Our formula doesn't move. Even when put under heavy pressure for long periods of time. This means even faster relief. RigiGel® packs have 3x more cooling power than ordinary gel packs, for longer treatments without having to swap the gel packs as often. RigiGel® packs also contain 10x more gel than ordinary packs, meaning superior coverage of your Baker's Cyst. The BFST® Knee Wrap is designed to stimulate blood flow in the injured area of your knee, accelerating the healing process. The BFST® Wrap emits deep stimulating EMR energy that penetrates below your skin to target your injured tissues. This energy promotes blood flow to the injured area, creating an ideal environment for healing. This is not a heating pad. Heating pads have very little therapeutic value since they only heat the surface of the skin. They do nothing to heal the damaged tissues deep below your skin. The BFST® Knee Wrap has 3 levels, allowing you to increase the power of your treatments as your knee heals. It's easy to use and the effects of each treatment last up to 4 hours. Since the Wrap and the Energy Web® are both specially designed to conform to your knee, you always get an even distribution of energy over the entire injured area. Maximum coverage of your injury means faster healing. Painkillers mask the pain, causing you to continue to stress and injure your knee. This will only make your condition worse. It is understandable that people need relief from the pain, so if you have to take painkillers, restrict them to times when you are off your feet. You can use painkillers to help you sleep. Using them when you are active is a recipe for permanent damage. The ColdCure® Leg Wrap is designed to relieve the pain associated with Baker's Cysts. This safe and effective pain reliever is also great at bringing down swelling and inflammation. The ColdCure® Leg Wrap is incredibly soothing and provides support and protection for your Baker's Cyst. The painkilling element is incredibly powerful and it works instantly - there's no 20 minute wait like with pills. Baker's Cysts can be extremely painful and debilitating. NSAIDs such as ASA, acetaminophen or ibuprofen are often used to treat the pain but these drugs do nothing to treat the actual condition. In fact, NSAIDs are known blood thinners and make the bleeding worse for fresh tissue injuries. Cortisone injections are used in extreme cases but these too are intended to address the pain. They do not promote healing of the injury itself and they put you at a very high risk of further injury. You don't have to wait for endless months in pain. You can heal much more quickly with the right treatment. For a knee injury, blood flow is the most critical element in rapid recovery. Blood Flow Stimulation Therapy (BFST®) gives your knee the blood flow it needs to heal quickly and completely. BFST® brings extra oxygen and nutrient-rich blood to the injured area - a requirement for the body to heal itself. Unfortunately, an injured knee at rest often has restricted blood flow, which extends your healing time and greatly increases the amount of scar tissue that develops. With a King Brand® BFST® Knee Wrap, blood flow can be stimulated in the area of injury while you are at rest. With improved blood flow and without physical activity and the risk of re-injury, you can recover from your knee injury at a surprisingly rapid rate. King Brand® soft tissue rehabilitation medical products are the #1 choice by top Athletic Therapists and Medical Practitioners worldwide. We provide guaranteed results and customer satisfaction. Like all King Brand® products, there simply isn't a better performing option. All King Brand® products come with a 100% satisfaction guarantee. Try our products and if you are not completely impressed, you can send them back for a full refund. We know you will love them though, because thousands of people already use them and rave about the results. King Brand® BFST® and ColdCure® Wraps are FDA Registered medical devices. They are intended to prevent, treat and cure soft tissue injuries and chronic conditions. Part of being an FDA Registered company means that our products are made from high quality, biocompatible materials. These devices are manufactured and tested to the highest safety standards in the industry. Note from KB WebMaster - The text below is primarily intended to assist with Google properly classifying this page content. To learn more about our products please visit our website.<br>Baker's Cysts plague many people. A knee injury can cause Baker's Cysts to develop. 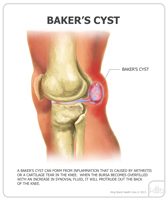 There are many symptoms of Baker's Cysts caused by knee injuries. Treatment for a Baker's Cyst will cause your knee pain to improve and allow your underlying knee injury to heal. There's no doubt that to heal knee injuries quickly you need BFST treatments. ColdCure will help with knee pain caused by Baker's Cysts. You can cure Baker's Cysts and a knee injury with BFST and ColdCure technology. So, if you want to get rid of your Baker's Cyst quickly, you need BFST. If you want to treat a Baker's Cyst you need ColdCure. Baker's Cyst symptoms are associated with an underlying knee injury and include knee pain and swelling. Some Baker's Cysts require surgery. This gets rid of the Baker's Cyst but the pain in your knee after surgery can be severe. The best Baker's Cyst treatment is BFST. The best Baker's Cyst pain treatment is ColdCure. These wraps are incredible. They feel comfortable. They work.